If I close my eyes and try to magic myself back to my weekend at the Qasr al Sarab resort, it is the sensation of trekking barefoot through the magnificent red sand dunes of the Rub al Khali desert that invade my thoughts. Traversing the sands of the desert is the stuff of Emirati legend. Born out of the vision of Abu Dhabi’s leaders to celebrate the traditions and roots of the emirate, Qasr al Sarab (“Mirage Palace” in Arabic) is set amidst the mythical dunes of the Liwa Desert, part of a 250,000-square-mile sea of land and sand that encompasses most of the southern third of the Arabian Peninsula, including Saudi Arabia, Oman, Yemen, and the United Arab Emirates. In 2006, the Tourism Development & Investment Company developed the resort to capture the rich history and traditions of the region. From the hotel’s architecture – imagine an ancient fort perched amidst wind-blown sand dunes – to the impressive roster of traditional desert activities, including sunset camel treks, archery, stargazing navigation, and sunrise desert walks, Qasr Al Sarab provides a holistic experience that allows the stylish tourist to experience an authentic Arabian adventure. Although Qasr al Sarab champions the Lawrence of Arabia experience, the resort, which is managed by Anantara, a 5-star hotel chain that boasts 28 magnificent properties from the Maldives to Mozambique, offers all of the decadent amenities of a luxury getaway. For example, in my one-bedroom villa, there was a private plunge pool with a sun deck and rain shower, as well as 24-hour butler service. What’s more, eight upscale restaurants are located on the property. 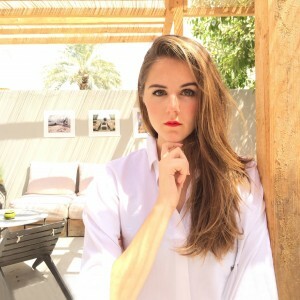 During my stay, I opt to dine at Al Falaj, a Bedouin-style dinner experience that is only available during the cooler months of the year. As I sit on a low cushion under the moon, devouring a mix of grilled barbecue – lamb chops imported from Australia, chicken, lobster – and oriental mezze, and listen to the hypnotic notes of a live oud musician, I’m amazed by the mix of sensuous luxury and old-world charm. At the spa, I enjoy the Qasr Al Sarab signature treatment, a 90-minute experience that begins with a floral foot ritual followed by a therapeutic massage. For those guests interested in exploring Arabian beauty traditions, I recommend the Royal Hammam ritual, which utilizes natural ingredients indigenous to the region, such as dates, sand, honey, and olives. With all of this talk of mirages, I admittedly pinch myself at various moments throughout my stay at Qasr al Sarab (especially while watching the rose-petal-pink sun ascend over the sun-soaked dunes during a sunrise desert walk), and am delighted when I realize this majestic haven is, in fact, not a dream. Where Will You Spend the Last Weekend Before Ramadan Starts?